Voluntary Interagency Transference Strategies: Cash or Card? Two of the prizes awarded to previous winners of the international Rosenberger forum for social engineering and enterprize. 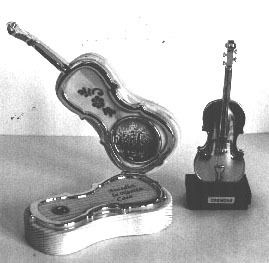 Right: A lefthanded cigarette holder awarded to Radovan Karadzic in 1992, and Left: An all purpose snuffbox awarded to Vladimir Zhirinovsky in 1993. On March 14 1899, Michael Morley sent out for two mail order violins - one from the Chang Lee People's Violin Factory in Shanghai, the other from a music store just across the street from the university. Of course everyone expected that the one from across the street would arrive first. In fact they both arrived at the same time. Where was I? Oh at the end already.